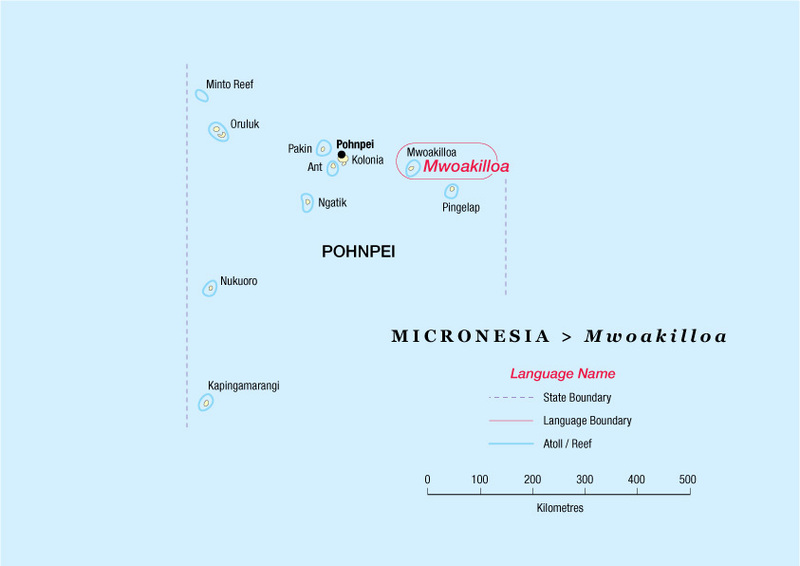 Mwoakilloa (total population about 1,250, of which fewer than 150 on the island itself) is very closely related to Pohnpeian but considered a distinct language, though it is under heavy influence of Pohnpeian. The majority of the Mwoakilloa people are living on Pohnpei, where they have three churches with services in their own language, apart from the Scripture readings, which are in Pohnpeian. In 2010, contacts were made with the people of the Mwoakilloa language group to determine if there is significant interest in a translation of the Bible into their language. On March 28, 2011, leaders from the Mwoakilloa community got together and decided to start translation work. In June 2015, the first draft of the New Testament was finished. Isles of the Sea translators Peter and Robin Knapp are involved with the project as advisors. First draft of Mwoakilloa NT completed! Mwoakilloa and Pingelapese Bible translation projects off to a flying start! On June 23-26, 2012, over 30 translators from the Mwoakilloa and Pingelap languages got together on the island of Pohnpei to kick off translation work. They received training in translation and translation software, but also translated all the daily readings for the next month.